Kitchen renovation projects are one of the most popular remodeling services today for homeowners nationwide. There are many benefits you can expect from this type of project, including better storage options, customized design choices, and a boost to your home’s value. It’s important to find qualified home remodeling contractors that can provide the best results for your home while staying within your budgetary constraints. Detail Design & Remodeling is proud to be your source for professional kitchen renovations and cabinet refacing in Atlanta. We create a personalized approach to perfectly cover all of your home remodeling needs. Our team is here to provide cost-effective cabinet refinishing and surfacing services, but we also specialize in custom cabinets as well as the rest of your kitchen needs. If you have been considering an upgrade to your Georgia home, our team is here and happy to offer assistance every step of the way. Beyond the home remodeling contractors you hire, the type of remodeling project you choose will also play a major role in the costs and benefits you can expect. Today, we’ll highlight the three types of kitchen remodels we offer, as well as pros and cons of each. When you are finished, be sure to reach out to the Detail Design team to see how we can optimize your home! As the name implies, this service includes a top-down refinish of your kitchen space. This option involves completely tearing out your existing cabinets and countertops, leaving the space bare and ready for a wide range of improvements. Complete remodels are ideal for homeowners hoping to make big changes to their kitchen. Our home renovation team is here to help you plan and build your kitchen to your exact standards, including custom cabinets, new countertops, backsplashes, hardware, and more. Full tear-outs are a great opportunity to revamp your kitchen’s style. We can work to update every element in your kitchen, leaving you with a quality space that is sure to impress guests for years to come. From overhead faucet options to custom islands, every decision is up to you! While a complete remodel can prove to be very beneficial in the long run, it does have some drawbacks. For one, this service is the most intrusive option, as it requires our home remodeling contractors to be onsite for long stretches of time. It’s important to remember that full kitchen remodels often require homeowners to find alternative spaces for all of their cooking, cleaning, and other kitchen-related needs. Keep in mind that this service can take between four and six weeks based on the intensity of changes ordered. In addition to this downtime is the cost of materials and labor, making a full remodel the most expensive option. All-new cabinet doors in a variety of shapes and styles. A new veneer that covers your drawers and the front and sides of your boxes. New hardware to further enhance your upgrades. Cabinet refacing is gaining momentum because it is a very efficient and eco-friendly option. Unlike a tear-out, which results in a lot of waste, your existing boxes are reused and simply spruced up for many more years of service and enjoyment. Less work and less materials also means less cost, which directly benefits your bottom line. Homeowners that are hoping to complete some modifications within their kitchen can receive the most gains from this option, as our contractors can provide some custom cabinet services while keeping your overall system in place. One advantage that your family will thank you for is the minimal downtime. While we’re refacing your cabinets, you can expect full use of the space. There may be one or two days where your appliances will be inaccessible. If this is the case, our experts will be sure to work with you for the best outcome by planning with you as far ahead of time as possible. Kitchen cabinet refacing typically costs half as much as a full tear-down, and you can expect to have your new kitchen ready in as few as four days. If you have numerous modifications on the plan, this end date may stretch out to two weeks. The most cost-effective service we offer is cabinet refinishing. This option is similar to cabinet refacing in that most of the components in your kitchen are left in place. Our home remodeling contractors will take the doors off and take them back to our shop for painting. There, we will work to make minor repairs and cover the doors with professional spraying equipment. Once this is done, we’ll return to your home and work on the other features, including hardware, veneers, and front-facing elements. Refinishing most often involves paint, but in some cases, we can utilize stain for a beautiful look. The downtime for cabinet refinishing typically for about a week. From taking your doors and treating them to fixing everything back up once they are ready, you will immediately notice the benefits of this cost-effective treatment that results in big changes. This option is perfect for homeowners who possess wood cabinets that are in good condition that require few changes. 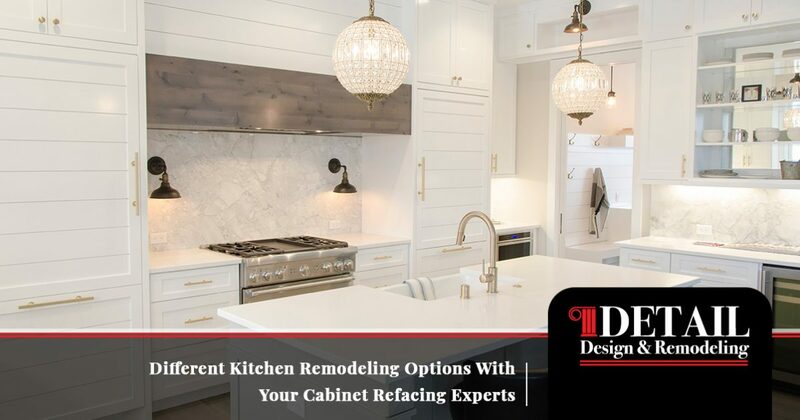 Detail Design & Remodeling is here to be your source for trusted and reliable cabinet refacing in Atlanta and beyond, delivering quality results that won’t break your bank. Our home remodeling contractors have the experience and equipment to perform nearly kitchen renovation. Contact us today to learn more and to find out which project is perfect for your home!